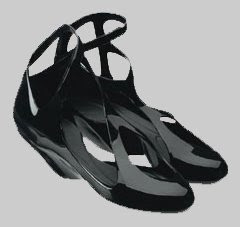 I nearly chocked with my breakfast cocoa cake when I saw this picture of Zaha Hadid & melissa shoe collaboration. I mean, what's that fabulous planet they come from? I'm pretty much convinced I'd do anything for a pair of these when they finally get out in September. Zaha Hadid, one of my architect idols (with all due respect, can I even say this? it sounds funny, yet it's the plain truth...) stated: "I have 30 years of research on different areas of architecture and design and this was a very challenging project, not only in design, but on the technical side. And there was great synergy; I worked very closely with melissa to transform my design into reality." Gosh, I so admire this woman!